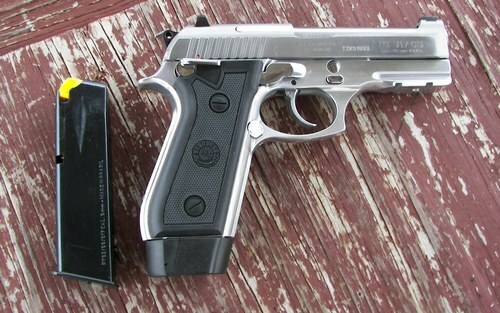 I saw the Taurus PT 917 CS (compact stainless) in the case at Cooper's Gun Shop where I was shopping for an exchange for a used Baby Desert Eagle that I had returned. I was looking for a carry gun for days when I have to go into the multiple locations where carrying a concealed weapon is currently illegal. My GLOCK 22 is my all time favorite carry gun, but I had to face facts and realize that under current restrictions it is not always ideal if carried ready to fire. It has to be handled too much to be safe in some circumstances. So, I set out in search of a good dependable carry piece with a decocker. The Taurus was not my first choice. A Baby Eagle was. I won't go into all the details but it failed with 3 different types of ammo. One brand of hollow points and reloaded ball ammo would not feed at all. So I returned it and went back to the gun case. The first thing that kept me from making the Taurus PT 917 my first choice was the size. While the gun is classified as a “compact”, that immediately strikes you as ridiculous because of the size of the gun. 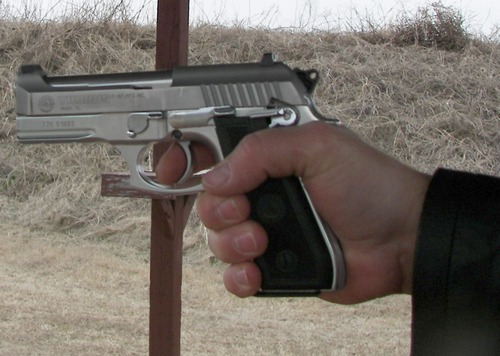 While the barrel is close to an inch shorter than the Beretta cloned Taurus PT 92, overall, the gun is the same length. And it is beefy. It just looks monstrous for a 9mm when you first look at it. But,since I like carrying full size handguns, I took it out of the case and gave it a look. As I held it, looked at it, worked it, and looked at it some more, I began to consider the Taurus PT 917 CS for a new carry pistol. Then I found out that in addition to the huge 19 round magazine that was in it in the case, it also comes with a smaller 17 round mag, I made my decision. I had certain expectations for the gun because I had previously owned a Taurus PT 92 that I had been missing. 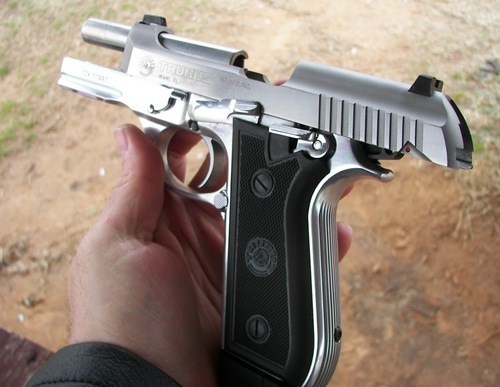 It was one of the great handguns I have owned and I kind of longed for this style gun again. So, I expected that I knew how it would shoot, aim and perform. At the range, it did exactly what I expected. Shot, and shot and shot and shot......4 kinds of ammo....all worked. 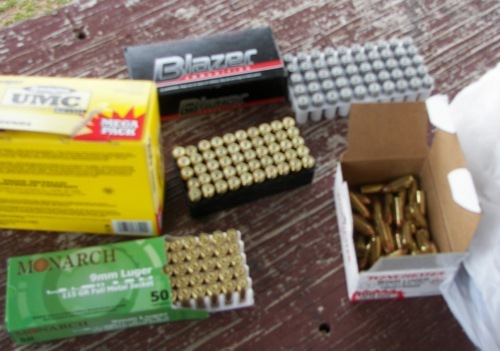 At the brushy hollow range on the following Saturday I put another 150 rounds through it with the same results. Utterly dependable. If I have a tendency shooting any gun, it is to shoot low left. Now when I concentrate, and control my trigger I can put it in the center of the target with the sights as they are on most guns. But, because I like to do some significant practice by quick sight alignment and fast fire, under those conditions I will shoot low left. Not to the point where I would miss center mass, but a couple inches off. With the Taurus PT 917, I automatically lined the top of the rear sight with the bottom of the front sight. Why? Because based on my experience with the PT 92, that's the sight alignment that allows me to shoot fast and accurately. As expected. The model I have has a front sight that is adjustable for windage, with a fixed rear sight. I will adjust the front sight slightly left for my shooting. A big plus for the gun, which is not required, but appreciated is that it is dazzlingly handsome. Now, obviously with my affinity for GLOCKs, I don't have to have that feature, but since it is a good looking gun, it is appreciated. The gun has a forged aluminum (alloy) frame, a stainless steel slide, and it sports a frame mounted decocker/safety that is ambidextrous. 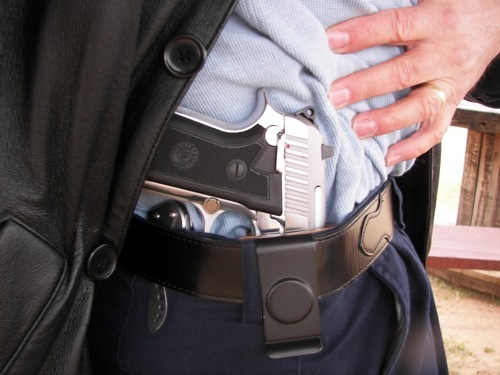 Size of the gun is no problem for concealed carry. The alloy frame keeps the weight down on this big gun, but how does it conceal? Well, for those of you who visit regularly, you know I conceal a full size handgun regularly for carry. A big bonus here was that the gun fits perfectly in the inside the waistband holster that I carry my GLOCK 22 in. I have carried the Taurus PT 917 under my suit jacket, casual leather jacket and an un-tucked casual shirt. No problems. The feel of this full size gun (8.5"Lx 5.543" H) is comforting, knowing that in an emergency situation, you can grab a handful of gun that will shoot every time. Bottom Line: The Taurus PT 917 is what I expected. Solid, dependable, fun to shoot and good looking. It also carries comfortably for a full size handgun. At the $469.00 new price I paid, I consider the gun, as all Taurus guns, a bargain.